Office life. Do physical exercises at your desk. Fitness in the office. Make a work break for sports in the office. Office worker woman. Woman leader, secretary, manager makes the workout. hands up. A sedentary lifestyle has recently been coined the new smoking. Can you imagine! The negative effects of sitting for a living are now rivalling the known health dangers of regularly inhaling deadly poisons! Wow. Let’s do something about it! 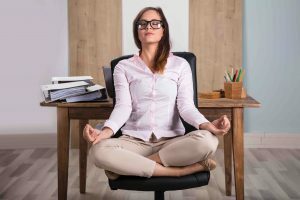 Yes, many of us have jobs that require us to sit long hours at a computer, driving, sitting in meetings, sitting at our desk, or sitting on the subway or train. Let’s take a few minutes every hour or two, to move, stretch, and get our blood flowing. It will not only help your body feel better, but your mind will also reap the benefits of added oxygen flow and feel the joy of movement and stretching! It is important to be mindful of your posture while at your desk or sitting in various positions. Try to sit up as straight as possible, and don’t lean in toward your computer. If you are straining to see your monitor, make the font larger or reposition it, as the very last thing to want to be doing is tilting your neck forward to see your screen. Over time, this can cause your neck to begin to curve forward and create a ‘forward head posture’. This is incredibly problematic for your body because your brain must be able to send all of the information your body needs to be able to function through your central nervous system. If your bones in your neck have shifted forward out of alignment from straining to see your screen, it puts an immense amount of pressure on your nervous system (which is encased by your spinal bones) and makes it very difficult for the information to get to all of the places it must reach to have your body function and heal at 100%. Focus on stretching your neck and back muscles, arms, shoulders and legs when you take a few moments regularly to move that body! Get your coworkers involved, as they are in the same position as you – hunched over your screen for hours on end! Stretch your arms and shoulders. Can you do this? Can you balance a book on your head and continue working? 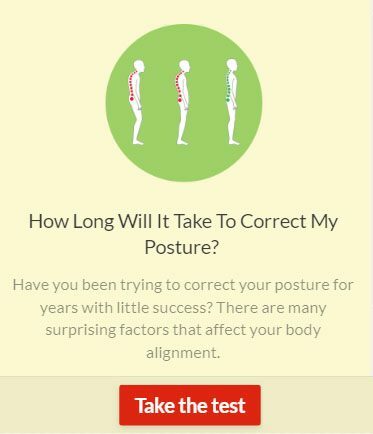 This will help to train you to sit up straight and correct your posture. Stretch! Move your arms, reach for the ceiling and feel your blood circulating. Arch your back and stretch your arms up, reach your neck back and up and hold for 10 seconds. Stretch your arms and use your chair to rest on, extend your legs and feel a stretch. Stretch your arms out and forward, and let your arms reach back to stretch your shoulders and expand your chest with your breath. Move your body side to side and let your spine move freely and stretch. Stretch your legs and hamstrings with the support of your desk and feel the blood reach down to your toes. Take a moment to centre your thoughts with a mini meditation over lunch. Focus on your breath and bring your thoughts back to your breath when they flit about to other ideas. Stretch your arms and wrists regularly throughout the day and remember to smile often! Next articleWhat Meat Do You Eat?